Born Michael Douglas, Michael Keaton dropped out of Kent State University to try stand-up, but before comedy could pay the bills he worked as a stage hand on mid-1970s episodes Mr. Rogers' Neighborhood. He performed as part of the Flying Zucchini Brothers comedy troupe, and joined Chicago's Second City improvisational group in 1975. One of his earliest acting jobs came in a 1977 episode of Maude. But before he could join the Screen Actors Guild, he needed to change his name, as both "Mike Douglas" and "Michael Douglas" were already taken. Diane Keaton was starring in Annie Hall at the time, and he liked the sound of her last name, so he became Michael Keaton. Keaton then landed a small role in the first of his several quickly-canceled sitcoms, All's Fair, with Richard Crenna and Bernadette Peters. He was a regular on two different Mary Tyler Moore flops, the 1978 sketch comedy Mary with David Letterman and Swoosie Kurtz, and the backstage dramedy The Mary Tyler Moore Hour in 1979, with Joyce Van Patten. He co-starred in Working Stiffs, with Keaton and Jim Belushi as brothers and janitors, and Report to Murphy, a cop sitcom. He fared much better in movies, at least through the 1980s and early 90s. His first film was Ron Howard's Night Shift, the morgue comedy with Henry Winkler and Shelley Long. 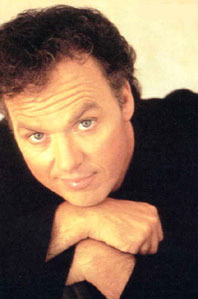 Keaton then starred in several successful comedies, including Mr. Mom with Teri Garr and Jeffrey Tambor and Tim Burton's Beetle Juice (although Burton reportedly wanted Sammy Davis, Jr. in the role). Keaton got good notices in his first serious drama, Clean and Sober, but when Burton decided that the scrawny comedian would play the lead in 1989's big budget Batman, fans of the comic book feared the worst. Keaton bulked up, though, and turned in a pretty gritty performance, even holding his own against Jack Nicholson as The Joker. He quit the series after the first lackluster sequel, Batman Returns, leaving subsequent Batman movies to Val Kilmer, George Clooney, and Christian Bale. After that, Keaton's career faltered, with lukewarm dramas like One Good Cop and semi-funny comedies like Speechless and Multiplicity. He had a small but memorable role as an FBI agent in Quentin Tarantino's adaptation of Elmore Leonard's Jackie Brown, and played the same character in Steven Soderbergh's Out of Sight, with Clooney. More recently he starred as a dead dad reincarnated as a snowman in Jack Frost, played a U.S. President to Katie Holmes's First Daughter, and starred as a tough CNN reporter in HBO's Live from Baghdad. In 1978, between sitcoms, Keaton starred in A Different Approach, a public service announcement for hiring the handicapped, which was Oscar-nominated as Best Short Film. Almost impossible to find today, it features Keaton as the director of a musical who has decided to use only handicapped actors. At the time, Keaton was the only "unknown" in the otherwise all-star cast, including then-big names from Melissa Sue Anderson to Betty White.